In 1940 just before WWII, one loaf of bread cost an average of 10 cents ($0.10). In 2008 during the global financial crisis, the average cost of a loaf of bread was $2.79. In 1991, the year of economic liberalisation, 1 litre of petrol (which powers millions of vehicles) cost Rs. 14.62. In 2008 during the global financial crisis, the price of 1 litre of petrol was Rs. 45.62. In 2014, just before the new government was elected, a litre of petrol cost Rs. 71.51. Do you see anything common between the two sets of statements above? …Economics is often referred to as the ‘dismal science’, probably because some of the theories it encapsulates, such as inflation, seem to be everywhere. In this article, we attempt to demystify inflation and present it in a simplified, jargon-free format. A better understanding of the phenomenon and its causes will help you devise strategies to protect yourself (and your wallet) from some of its most crippling effects. There is a popular misconception that inflation refers to the simple rise in prices of goods and services. Although it’s easier to understand inflation in terms of increasing prices, this is not an accurate way to explain the concept. This is because inflation refers to the rate at which prices rise, not their actual rise. In simplest terms, inflation is an increase in the level of the prices of goods and services as measured over a specific period of time. Between 2015 and 2016, the price of the marketing textbook increased at an annual inflation rate of 25%. Its price also increased from 2016 to 2017, but in this time period, the annual inflation was only 7%. Thus, in both time periods, the price of the marketing textbook increased, but the inflation rate fell from 25% to 7%. Similarly, the price of 1 kg of potatoes increased in both time periods. But from 2015 to 2016, the rate of price change, i.e. inflation, was only 17%. But between 2016 and 2017, this rate shot up to 43%. What these two examples show is that it is possible for inflation to fall even if prices are rising. Therefore, to determine if inflation exists or not, it is not enough to simply review price rises; it is necessary to compare price changes over time. Since inflation refers to a rate, i.e. change in prices over time, it is always expressed as a percentage figure. Doing this helps us compare price changes between time periods (such as months or years). It also aids governments and policy-makers to devise policies to effectively control it and mitigate its possible negative effects on the economy’s growth and productivity. During June 2018, the general (overall) prices of goods and services rose at the rate of 5%. In the previous month, prices rose as well, but they did so at a slower rate of 4.87%. Thus, prices rose in both time periods, but the rate at which this change took place was faster in June than in May. Measuring inflation is no easy task, even for expert economists, statisticians and policy wonks. Nonetheless, inflation is usually measured by first putting together a number of goods and services that are representative of the economy into what is referred to as a market basket. Then the cost of this basket of goods and services is mathematically compared over different time periods, such as years, months or weeks. This comparison results in a price index, which represents the cost of the basket in the latter time period as a percentage of the cost of that identical basket in the earlier time period. Consumer Price Index (CPI): The CPI represents inflation, i.e. price rises, from the consumers’ perspective. It is a measure of price changes for a basket of consumer goods and services such as fuel, automobiles, medical care, clothing, beverages, food, etc. It is calculated by first calculating the price changes for each item in the basket and then averaging them. CPI is a good proxy for understanding the cost and standard of living in the economy. Wholesale Price Index (WPI): The WPI measures price changes of goods and services from the perspective of sellers (producers). It measures the average change in selling prices over time by domestic producers in the stages before the retail level. The WPI basket takes into account commodity prices, but the products included vary from one country to another, ranging from a few hundred for small countries to thousands in the WPI index of large industrial countries like the United Kingdom and the United States. In the short term, the WPI generally increases before CPI and therefore the rates of inflation as measured by the two indexes tend to be different. In the long term, however, both CPI and WPI show similar rates of inflation. Some other indexes are also used to measure inflation, such as the Producer Price Index (PPI) and the Retail Prices Index (RPI). I Am Not An Economist Or Policy-Maker – Why Should I Care About Inflation? Inflation is a good proxy for the purchasing power of a currency, a fact that affects everyone, irrespective of social status or financial wherewithal. Inflation can decide whether you thrive or simply survive. Increasing inflation indicates that not only are prices rising, but they are rising at a rate that is much higher than incomes. When prices rise faster (or more) than incomes, the value of a country’s currency falls, which then reduces its purchasing power. When the purchasing power of a currency falls, it is said to be devalued. At a societal or national level, rising inflation causes everyone’s purchasing power to be reduced. The super-rich may not notice it much, but this is as true for them as it is for the struggling retiree, slum-dweller or minimum-wage earner. Over a period of time, consistently high levels of inflation lead to a slowing or stagnant economy. When inflation rates are extremely high and still accelerating upwards unchecked, it may lead a situation referred to as hyperinflation. On the other hand, negative inflation or deflation, which indicates a massive, widespread drop in prices slows down economic growth and increases unemployment. For any country, the inflation rate tends to be recurrent, rising when the economy is doing well; and slackening when consumers are less optimistic about the economy and therefore thriftier about their spending habits. How Does Demand-Pull Effect Impact Inflation? As the name indicates, this effect refers to increasing consumer demand. When an economy is growing, unemployment tends to fall and wages tend to rise. Thus people have more money to spend (i.e. there is more liquidity in the economic system) on consumer goods, which increases the demand for these goods. To accommodate and offset the increased demand and thus balance supply with demand, firms will raise prices of these goods. This leads to inflation. In India, traditional sweets are a very popular gift item for Diwali, so their demand tends to rise just before the festival starts. To accommodate this demand, producers raise the prices, leading to demand-pull inflation (of sweets). How Does Cost-Push Effect Impact Inflation? According to this theory, when input costs increase, prices of the finished product will also increase. When companies are faced with increased input costs (such as labour, raw material, utilities), they will pass on the increased cost of production to the consumer in the form of higher prices. When the price of coffee beans goes up, it also drives up the price of a cup of coffee at cafés. This is because each cup of coffee is now more expensive for the café to make, so the increased input cost is passed on to the consumer. How Does National Debt Affect Inflation? The national debt of a country may seem like a far-removed phenomenon for the common man. Nevertheless, it is one of the most important drivers of inflation in an economy. When a country’s debt (or deficit) increases, the government can either raise taxes or print more money to pay it off. When taxes are raised, businesses will pass on their increased burden of corporate tax to consumers by raising prices. This leads to inflation. But what happens if the government chooses to print more money to cover its deficits? Will it also cause inflation? We explain this in our next point. If the government of a country decides to put more money into the system by printing more of it, the increased money supply will cause monetary inflation. More money in the system means the value of the currency will fall, which means that its purchasing power will be reduced. Each unit of currency is now worth less than what it was before more money was printed. Also, more units are available for the same amount of goods in the economy. This mismatch leads to increased demand and thus higher prices, i.e. inflation. This is analogous to the less-is-rare philosophy observed in the precious gems or art markets: the Kohinoor diamond and the Mona Lisa are worth billions of dollars because they are unique and therefore rarest of the rare. If more Kohinoors or Mona Lisas existed, they would not be as valuable, and therefore their prices would be lower than what they currently are. What Effect Do Exchange Rates Have On Inflation? As the world becomes more globalised and interconnected, exchange rates fluctuations between the currencies of two countries can affect prices – and therefore inflation – in both countries. Consider two currencies, the US Dollar (USD) and the Indian Rupee (INR). 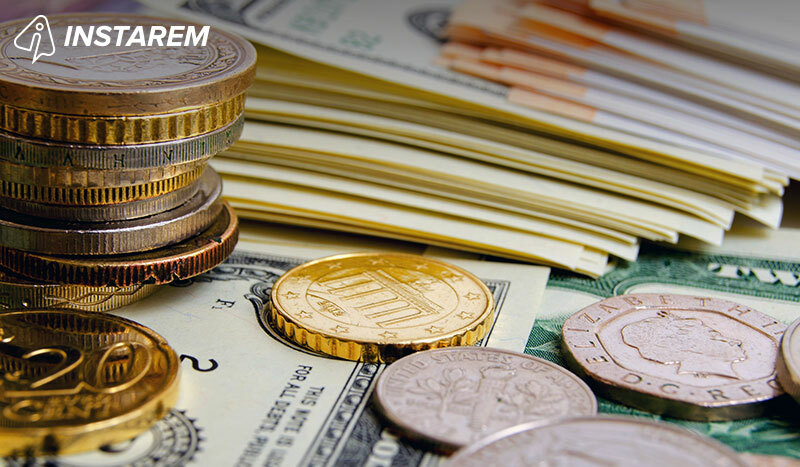 Since currencies are dynamic, their values with respect to each other are constantly changing. If during a particular time period (say, a day), the INR falls against the USD, it becomes weaker than the USD and makes American imports more expensive for India. When Indian importers buy American goods, they pay for them in INR. The devaluation of the INR means that importers have to pay more for the same amount/type of goods they import from America. Importers pass on this increased cost to Indian consumers by raising their sale prices. This again increases inflation in the economy. At the same time, the falling value of the INR makes Indian exports to the USA more competitive. Since Indian exporters are paid in USD, which is now more valuable, their profits increase so the exchange rate differential is a positive phenomenon for them. This is why inflation and consequently a devalued currency are more beneficial for export-oriented countries like China. Deflation has the exact opposite effect on imports and exports: imports become cheaper and exports become less competitive. Rising prices have a negative effect on consumption as well as business expenditure. When goods and services become more expensive than wages, consumers can afford to purchase less. Since their inflation-adjusted income, i.e. their real income is lower than their nominal income, their purchasing power falls. Inflation is a kind of hidden tax which redistributes wealth in an inequitable way, putting a greater burden on those groups in the system who are least able to bear it (such as fixed-salary earners or fixed pension-dependent retirees). This lowers the standard of living across the economy and curtails economic growth. Inflation and interest rates are very closely related: rates tend to rise when inflation goes up and fall when it comes down. In most countries, economic decisions are taken by their central banks (for example, the Reserve Bank of India or the Federal Reserve of USA). The central bank sets the baseline interest rates and adopts an annual inflation target to maintain low unemployment levels, stable prices and steady economic growth. When the central bank’s baseline interest (i.e. the rate it charges on loans to banks) is low, banks pass on their lower cost of borrowing to consumer and business borrowers in the form of cheaper loans. This spurs consumer spending, increases supply (and innovation), which then stimulates economic growth and can then cause inflation. To prevent the economy from growing too fast and causing hyperinflation, the central bank raises interest rates, which curbs growth but also controls inflation. The optimal level of economic growth and therefore inflation is somewhere between deflation and hyperinflation. It is the central bank’s responsibility to maintain that delicate balance. Since inflation refers to a currency’s devaluation, it negatively affects investments and savings by eroding their value. During times of high inflation, a firm’s supposedly high returns may make it look like it’s prospering, so a stockholder may assume that his investments are growing. However, the reality is that inflation is the reason behind the apparent growth. When adjusted against inflation, growth is not really growth at all. This can wreak havoc on investors’ earnings and lead to a true loss. Inflation also affects the returns on fixed-income investments. The erosion of the underlying currency means that the real interest rate (growth of purchasing power) is lower than the nominal interest rate (growth rate of the investment). As a result, actual (i.e. real) returns are lower than what they would have been in the absence of inflation. Investors – stockholders, bond-holders, fixed deposit holders, etc – function as money lenders. Since inflation erodes the value of their investment, they suffer a loss. At the other end of the spectrum, inflation makes it cheaper to borrow, leaving borrowers better off. The bottom line is that inflation benefits borrowers at the expense of lenders. When interest rates are low, consumer spending and economic growth increase and have a generally positive effect on the currency’s value. However, when demand exceeds supply, inflation may ensue. Low inflation and interest rates do not commonly attract foreign investment. When interest rates are high, foreign investments tend to increase, which also increases the demand for a country’s currency. A high inflation rate has a significantly negative effect on a currency’s value and therefore its exchange rate. When a currency loses value vis-à-vis another currency, imports become more expensive because the country must pay more for imports in local-currency terms. When the exchange rate of its currency falls against multiple other currencies and the country imports goods from all these countries, the combined effect leads to economy-wide inflation in the country, even if its partner countries don’t raise their prices. The reverse phenomenon can also occur, i.e. exchange rates can affect inflation. Depreciation in the exchange rate devalues the home currency, increases inflation and makes imports more expensive. On the other hand, an appreciation in the exchange rate makes the home currency stronger, reduces import prices and lowers inflation. It is important to note that inflation is not all bad. Some inflation in the economy is a good thing, as long as it can outpace the growth of the economy – as measured by Gross Domestic Product or GDP – by a small amount every year. This is why moderate inflation is considered desirable and welcomed by markets. It is also why governments and central banks utilise a policy of inflation targeting. You don’t have to be an economist, a politician or a banker to understand inflation and remember that it (or some form of it thereof) is real, pervasive and permanent. At the individual level, high inflation can affect savings, incomes as well as standards of living. At the corporate level, it increases costs and reduces profitability. At the societal level, uncontrolled inflation makes the economy worse off. As the old cliché goes – knowledge is power. Therefore, understanding the causes and effects of inflation can help you devise strategies to mitigate its risks to your financial well-being.